All of my pottery is unique and one-of-a-kind. I have both wheel thrown and hand built pieces and take great care in the making process. Most of my pottery is made from stoneware clay because of the strength and durability that can be achieved from it. The glazes on my functional ware are food and dishwasher safe. I have pottery that I made for my own personal use that's over a decade old. It's proven the test of time to me. I feel good about being able to offer this same type of work to the public and feel comfortable that it could be in use for generations to come. My main body of work is pottery but I also paint when I can. I work with oil paints and enjoy the fact that the paint can easily be blended and is workable for quite a while. 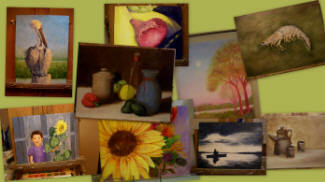 I have accomplished quite a few nice paintings so I am offering some of them for sale on my "Painting Gallery" page. 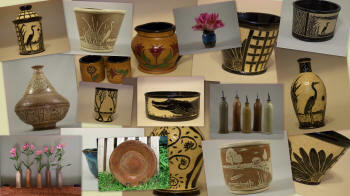 This is a web site to show case an online gallery of my pottery and paintings. I have made quite a bit of pottery through the years and haven't been able to show it all at once at sales and events. I'm finally showing every piece I have available. I have some early pieces as well as my recent work listed. If you would like to be notified of future sales and kiln openings, subscribe to my blog and get email update notification. I will put notice of what is new there and you can refer back to this website for purchases. It's free and you can cancel at any time. I'm so happy my web site is finally complete. I will be keeping my fingers crossed that everything is working as expected. My new studio space is set up and ready to go. Now that these tasks are complete, I'm able to concentrate on clay work once again. I've worked up some designs already and I have many ideas for more. It's so exciting to be able to go forward and turn those ideas into a body of work that I will be able to easily offer to the public. If you have any questions or comments, please do not hesitate to contact me.